Steve and Barb Helsper from All in One Wine Pump – We did a presentation this past Tuesday at the Sun Prairie Wine Makers Club in Wisconsin. We asked to test out our presentation skills as we prepare for the WineMakers Conference in May. 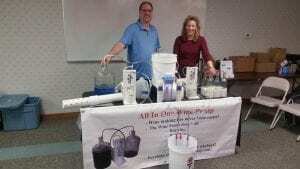 It was a 30-minute demonstration – WHICH included how to rack, degas, transfer and filter using the All In One Wine Pump. We also had the pressure washer/sanitizer and all of our other accessories on display. There were approx. 60 people there; they are definitely a fun and knowledgeable group of winemakers. We thoroughly enjoyed our time there. We actually took a trade-in OF one of our original models, from the beginning of our journey (approx 10 years ago). The gentleman wasn’t sure if he wanted to part with it as it still works like a champion.He had just transferred and bottled 18 gallons the day prior. We are looking forward to future gatherings with this group and many other clubs as we expand our exposure.